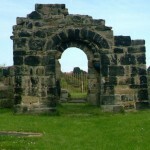 On the north end of the Burn Closes Bridge in Wallsend lies Holy Cross which houses the ruins of one of the United Kingdom’s oldest medieval churches. The Holy Cross medieval church ruins & graveyard stand at the Apex of Wallsend above the Wallsend Burn and aptly sit at the rear of the current Holy Cross Cemetery and less than 1 Kilometre from the replacement parish church of St Peters which is situated on the Wallsend town centre side of the new burn closes bridge. 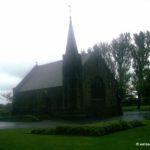 The main Holy Cross thoroughfare, St Peters Road, leads past the cemetery to St Peters playing fields where famous Geordie footballers such as Peter Beardsley, Alan Shearer & Michael Carrick to name a few, often played football as youngsters. The following slide show is of the steps giving access from the Wallsend burn & the Holy Cross church ruins which dates back to medieval times and the graves in these ruins date back to the 16th century. Archer Street leads you up along the top of the Wallsend Burn past the Archer Street War Memorial and on up through Rosehill where you will find the The Archer Street Club, The Rosehill Tavern and The Rosehill Club on Angle Terrace. If you take the path south from Archer Street down to the Wallsend Burn you will find the Rose Inn Public House. 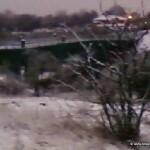 As a boy I and many others played in Wallsend Dene. Happy memories of camping and playing out doors. I visited today probably 50 years later and was disappointed to find it so overgrown and inaccessible. It understand it is now a ‘Nature Reserve’ . It always was, we caught frogs and newts, chased partridges on the Hospital field., took eggs from birds nests all the things kids did in the 50’s before tablets and phones. It is a great shame that kids of today do not have access to adventure space.